English top-flight clubs are "angry" that settlements were made with some of their Premiership rivals over last season's salary cap, says Northampton chief executive Allan Robson. Northampton are among nine clubs who have since denied their involvement. Robson said Saints paid "up to the maximum of the cap but not beyond". "I think some of the clubs, count me in, have had an anger about the whole episode," Robson told BBC Radio Northampton. "Clearly there have been two clubs that have had settlements because of disagreements as opposed to proven breaches. "One of the main objectives of the salary cap was an equal playing field so that 12 clubs could go out on the pitch fairly, much similar in the quality of their playing departments and that would make life very competitive out on the pitch. "When you believe that some clubs have not complied with the salary cap regulations and you're one that has, it can make you angry to think 'have we just lost a game and was it on an even footing?'." 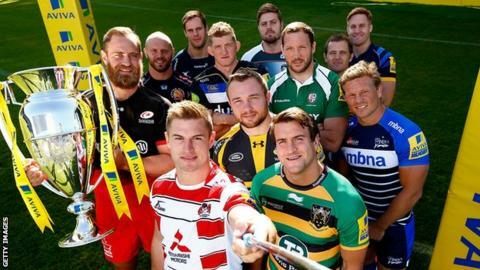 On Thursday, Saints, Gloucester, London Irish and Exeter joined Wasps, Harlequins, Newcastle, Sale and Worcester in confirming that they were not among the clubs that Premiership Rugby reached agreements with over last season's cap. The salary cap for this season is £5.5m, rising to £6.5m in 2016-17 and £7m the season afterwards. "We're not a team that's breached the salary cap," Exeter head coach Rob Baxter told BBC Sport. "I know some clubs have made comment on whether they've backed a cover-up or whatever, as far as I'm concerned we know what our budget is here as a club. "We've worked very hard and from the first day I was head coach, I've known what my budget is, the directors here and the people here have worked very hard to get us the best budget we can." In a statement, Gloucester said the club was "fully supportive of the salary cap". "As a club, we always try to operate with the highest integrity and we are fully committed to making the salary cap work," the statement said. "As such, in light of current questioning, would like to communicate that Gloucester Rugby is not one of the clubs to which Premiership Rugby referred within its statement as being involved in conversations relating to access to information and to commercial contracts where there were differences of opinion as to the inclusion or not in a salary cap." London Irish said in a statement: "London Irish can confirm it was not subjected to recent PRL salary cap investigations. The club fully supports and has adhered to the salary cap regulations since its inception and will continue to do so."